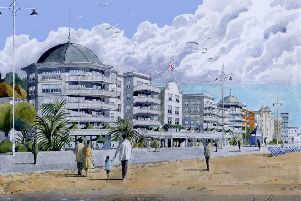 Funds to ‘kick-start’ a major refurbishment of Bognor Regis’ seafront bandstand have been welcomed. Arun District Council has secured £49,864 from the Government’s Coastal Revival Fund to pay for new metalwork to complete the intricate bandstand railings and to relocate the gate to align with the steps up on to the structure. A second phase of work will see the roof renovated and the existing concrete floor and brick plinth replaced with materials more in keeping with the original design. This phase will also see the bandstand being prepared for seating for the new café which has been proposed to the east of the structure, subject to planning consent. Stephen Haymes, cabinet member for technical services, said: “This is great news. The funding will kick-start a major refurbishment of this treasured heritage structure. Phil Hitchins, Chairman of the Bognor Regis regeneration sub-committee, added: “This funding will take us closer to bringing the bandstand back into regular public use. It will still be used as a bandstand, but also will provide seating for the new café, which will be a unique way for the public to experience this beautiful structure. At Monday’s regeneration sub-committee meeting officers made it clear the second phase of works would require a separate bid for more funding. They described how the project would also look to provide improved lighting for the bandstand and some form of transparent windbreaker.